Since the tomatoes are heavy-fat and scarlet-red on the vine, it's only fitting that they take center stage at meal time. Here's a best-tomato worthy recipe that I developed for Cooking Light Magazine in 2006. At that time, they were hunting for reader recipes for their first annual cook off. I submitted a couple of recipes, and was invited to attend the cook off for my Summer Chicken Piccata. Later they asked permission to also run this recipe in the magazine in the May 2006 issue. What an honor-but also a testament to how savory and delicious it is. I trust Cooking Light. So trust CL and me-you'll love it, and with it's healthy profile it will love you right back. Notes: You can double the dough and freeze half for another flat bread. You can make this crust with at least half whole wheat for a heartier and healthier recipe. If you're pressed for time, don't make dough at all. Use purchased pizza dough or even slather the toppings on French bread. Preparation: Dissolve yeast and sugar in 1 cup warm water in a large bowl; let stand 5 minutes. Lightly spoon flour into dry measuring cups; level with a knife. Add 2 3/4 cups flour and 1 teaspoon salt to yeast mixture, stirring until well blended. Turn dough out onto a floured surface. Knead until smooth and elastic (about 5 minutes); add enough of remaining 1/4 cup flour, 1 tablespoon at a time, to prevent dough from sticking to hands. Way to go Prudy having recipes in CL! I don't blame them for wanting to publish this, it looks so good and healthy and italian! This looks great - my kind of food! Why you little "Celebrity" you! Tomatoes and yellow squash have to be my most favorite thing about summer eating. This looks so yummy and BTW have you ever been to Georgia? I could use some of this today. Hospital food and eating on the run just isn't getting it! I just want to stay home and cook. Maybe it won't be long now. Blessings on your day. afekuika- my word varification. Sounds like a bad disease. Thanks so much for your kind words. I wish I could claim credit for this photo, but it is from the staff at CL. My photos are of the mediocre home variety. awesome! I knew I recognized your name! I am still waiting for my oven to be fixed because I really want to make your rhubarb struesel cake with the leftover rhubarb I picked. This looks soo good too! That pizza looks delectable. Great photo too, looks like it belongs in a magazine :D.
my garden is chock full of tomatoes and basil (as long as i can stay on top of these dang tomato horned worms--they are hideous and alienlike. you should google it and see what we are dealing with over here.) anyway, the point is that i have all the right ingredients to make this dish at a truly penny pinching price. thanks, prudy! This looks so colorful and delicious! Congrats on having your recipe in Cooking Light! This looks so delicious and right up my alley. I can't wait to give this one a try. And I think it would be another great way to get the kids to eat their veggies! 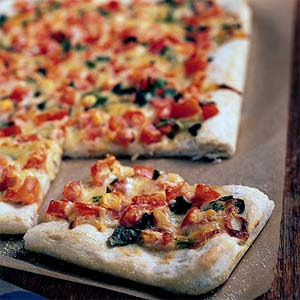 We have been making homemade pizza a lot lately..it is easy and so tasty with all the fresh veggies this summer! Your recipe looks great. I'm with you and CL this looks spectacular girl! Way to go! This is my kinda pizza, flatbread whatever you call it, I want some now! Have you ever tried making the crust with whole wheat flour? I love homeade pizza..this looks wonderful! I left an award for you on my site..............I know everyone is busy..so no need to participate..I just wanted to show some love! Prudy, the pizza looks great! I love making pizza because you get to be control of what you put in it. You amaze me! Congrats on the award from the CL magazine. That is impressive. This looks so good. I can't wait to try it with tomatoes from my garden. It looks amazing! Have you tried grilling pizza? If so, do you have any tips? I just keep finding out how famous you are ! :-) Cooking Light is one of my favorites. The pizza looks great! Thanks Prudy on you kind words on my video blog! I soooo wish I looked like one of the famous people! This looks so savory! Now I am hungry. Prudy, I love your blog, I read it religiously! Is there any way you can ask your readers to visit my blog and give me some advice? I would love it! it is temparoo at blogspot. Hello rock star! I am so impressed that you are this super cool published cook...I feel special by association! I just added the ingredients for this and the chicken to my shopping list! After picking up some fresh basil at the farmer's market, I made this for my roommates and they loved it. They suggested that next time we try adding some artichoke hearts or even roasted chicken. Thanks for another wonderful recipe, Prudy!